Imus the Dull is an Imperial commoner and beggar trying to get by in the city of Anvil. He sleeps on his bedroll behind The Flowing Bowl at the dockside every night between 10pm and 6am. 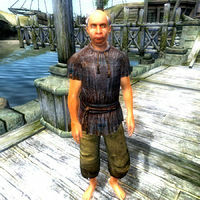 After waking up, he enters the main part of Anvil and spends the first four hours of the day begging near the Dock Gate. At 10am, he will try his luck on the stairs to the Chapel of Dibella for another four hours. After that, he returns to the dockside and will stroll up and down between the two docked ships until 6pm. At that time, if he has found any food, he will eat it where he stands or simply walk around starving until he returns to his bedroll at 8pm. In heavy rain, however, he will break up his schedule and seek shelter in front of Heinrich Oaken-Hull's house until it clears up. Imus is infected with the disease Ataxia, and you can be infected as well, should you engage him in combat. He definitely qualifies as poor as he owns nothing but his cup, a pair of sack cloth pants, a sack cloth shirt, and whatever gold he has managed to earn during the day. This page was last modified on 1 July 2013, at 22:02.